Last week I asked what we might do with a collection of coral and shells. There were a few very interesting answers. Today I will pick one of the items and take it a stage further. 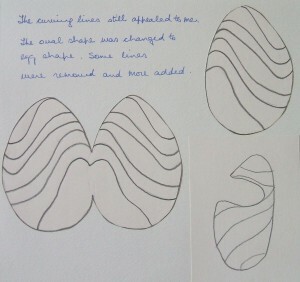 A section taken from the drawing and the lines enlarged. 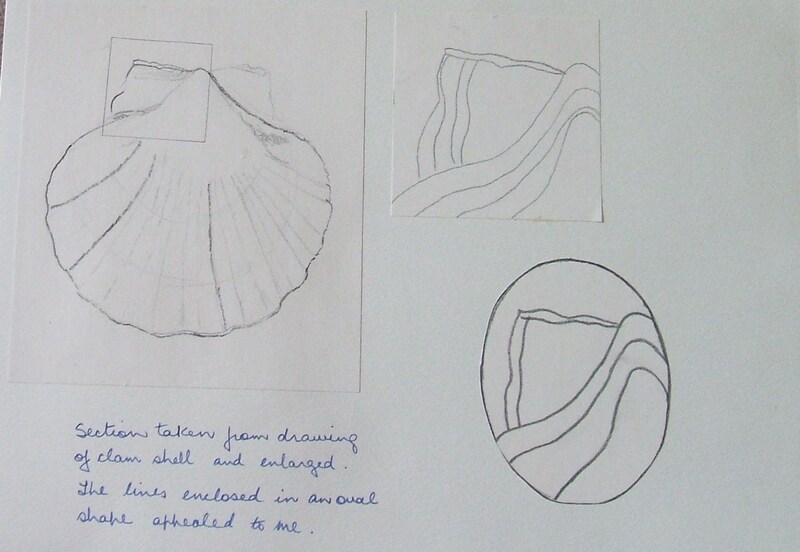 I then placed it in an oval shape. 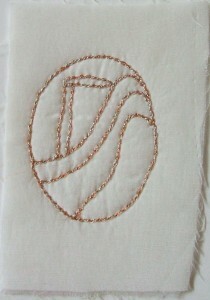 The shape quilted onto silk with a layer of wadding backed with muslin. 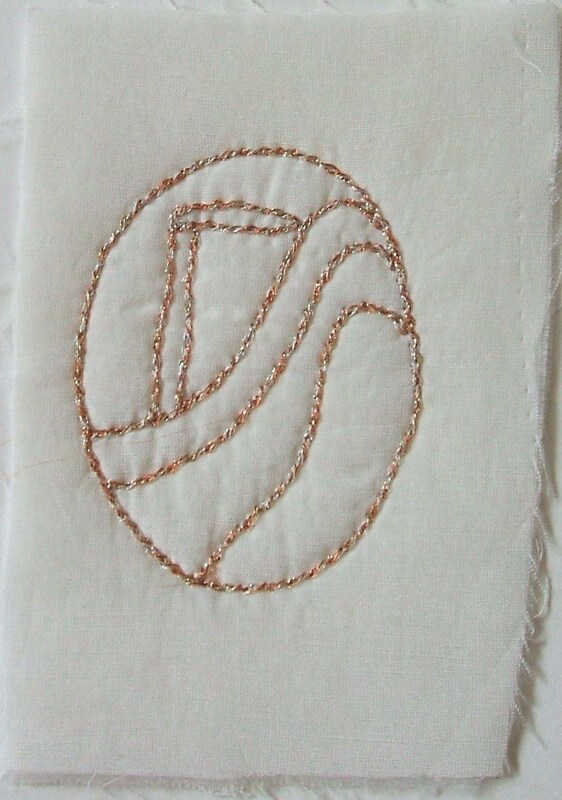 The stitch used was a simple chain stitch in a decorative thread. 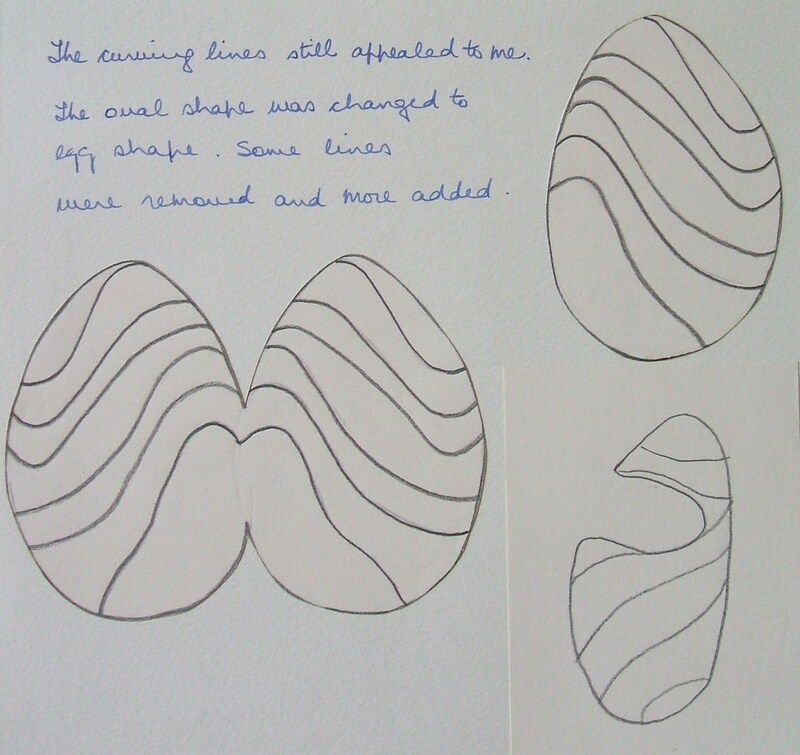 Using the curved lines and changing the oval to an egg shape, I removed some lines and added others. I hope I have aroused your curosity to come back next week to see the fruits of my labour. This entry was posted in Crafts on September 23, 2009 by Grannymar. Back to work already? You’re doing great. I’ll come back to see the results of that work. 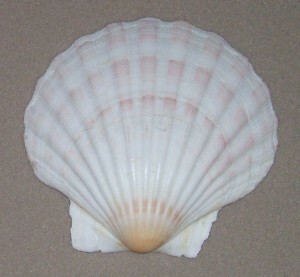 How annoying that a shell immediately makes me think of a large well-known oil company. How commerce insinuates itself into the most innocent things! But you’ve certainly whetted my curiosity. What amazing creation will Grannymar come up with this time (I’m still thinking of that lovely purple bag)? You have the ‘brain’ of a graphic designer, the ability to deconstruct yet retain the semblence of pattent. A rare talent Grannymar. I really want to make a quilt. Just need some time. Interesting…the clam shell is a scallop GM BTW….I thought of Coquilles St Jacques (Scallops with mushrooms in white wine) and Santiago of Compostela (St James ) It was long a symbol of pilgrimage and various Christian organisations have it as a symbol, I believe. As a symbol of fertility, it can be see in The Birth of Venus of Botticelli and pre-dates the Christian use. Gaelikaa – Work in short bursts as I need to do exercises, walk and have an hour three times a day lying on the bed! It will pass and soon I will be back to normal. Nick – Two surprises in store for next week. Steph – I thought you were quiet today. 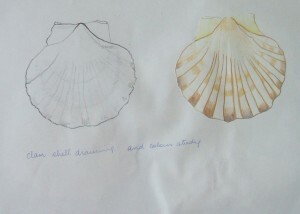 Magpie – I knew you would keep me right about the shell. I was way too tired last night to check it out. this resonates with me GM as I collect the shells in front of my house on the shore and use them (spoonrests, candle holders, incense holders, etc) and have a knitting design based on them. Some in my collection are enormous. I love your deconstruction, tell me is this a current or a past project? if current, take it easy woman, we want you in fine fightin’ fettle here! That large well known oil company published a book called (IIRC) The Shell…. interesting book…. the missus and I first came across it on our first holiday together in 1972…no Honey moon for us…..
Grannymar, go to Conrad’s post and give him some advice on posting recipes. I got a headache trying to read it! I guess he doesn’t want the world to know his secret ingredient. You’re nearly there, I’d say. WWW – It is part of a past project. I am taking things easy. I took all the photos pre-op to help make posting easier. Maynard – I will indeed visit as soon a I can. I am way behind with blog reading, at least I will always have something to amuse me. Gaelikaa – I am getting there slowly. Nothing like a creative project to speed the healing. First round I learned to draw courtesy of “Drawing From the Right Side of the Brain.” Conrad even posted some of my attempts. Other surgeries resulted in knitted dishcloths – I was my own little factory. Guess what everyone received for Christmas? 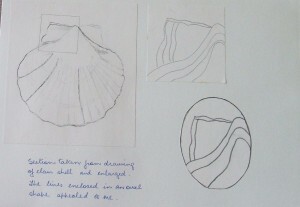 Marianna, this is an old project. So far I only have two sets of exercises. I am told it has something to do with the position the surgeon places the entry point for surgery.